Last night’s Expo Bikeway meeting. 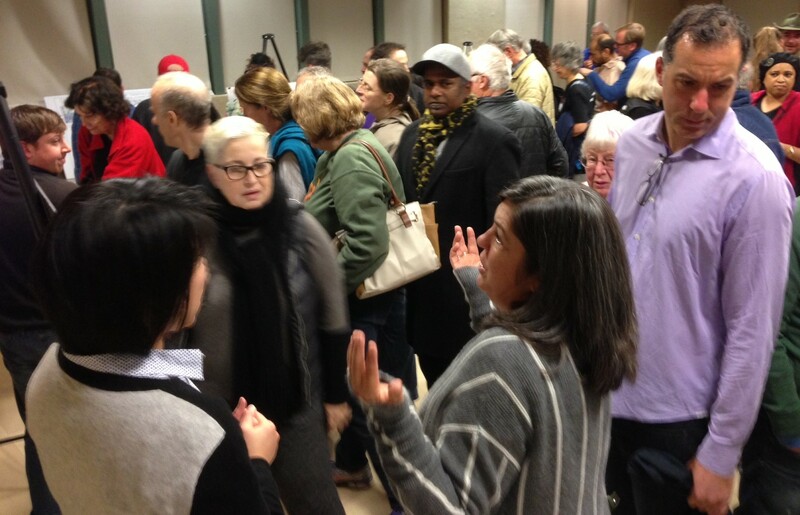 Photo: Joe Linton/Streetsblog L.A.
An overflow crowd of more than one hundred people showed up to last night’s Expo Bike Path meeting at the Palms-Rancho Park Branch Library. A representative from Councilmember Paul Koretz welcomed the boisterous crowd before turning the open house over to L.A. City Transportation Department (LADOT) Senior Bicycle Coordinator Michelle Mowery. The crowd appeared to be about half from L.A.’s bicycling community about half from the adjacent Cheviot Hills neighborhood. Many Cheviot Hills neighbors have actively opposed to both the Metro Expo rail line and the Expo bike path. Mowery stressed that “no decisions have been made” about how to close the 0.7-mile “Northvale gap” in the Expo bikeway. She stated that the meeting would be just an open house, and requested that all concerns be submitted in writing. As Mowery directed attendees to speak with city staff at an array of poster stations, disparaging comments were uttered by attendees: “this is ridiculous” and “we’re like sitting ducks” – apparently by neighbors opposed to the bikeway. In mid-2016, when the completed portions of the Expo bike path open, LADOT plans an “interim detour” sharrowed bike route on Northvale Road from Overland Avenue to Motor Avenue. This route avoids nearby heavily-trafficked streets, but is not great for bicycling as it is rather hilly close to Motor Avenue. The final gap closure bikeway will run in a relatively flat alignment, just north of the Metro Expo Line tracks. There were three design options presented, described after the jump below. All of these share a basic 1800-foot off-street bike path for the eastern stretch between Dunleer Drive and Motor Avenue. They only vary between Overland and Dunleer. Option one includes two-way protected bike lanes running along the south side of Northvale Road. This is the least expensive option at an estimated $13 million. Costs are saved by minimizing widening and curb work. It would eliminate existing parking on the south side of Northvale; city staff studied parking utilization on that side of the street to be typically five to twelve cars. Option two is similar to Option 1, but the protection instead of being just bollards would be an actual concrete curb. 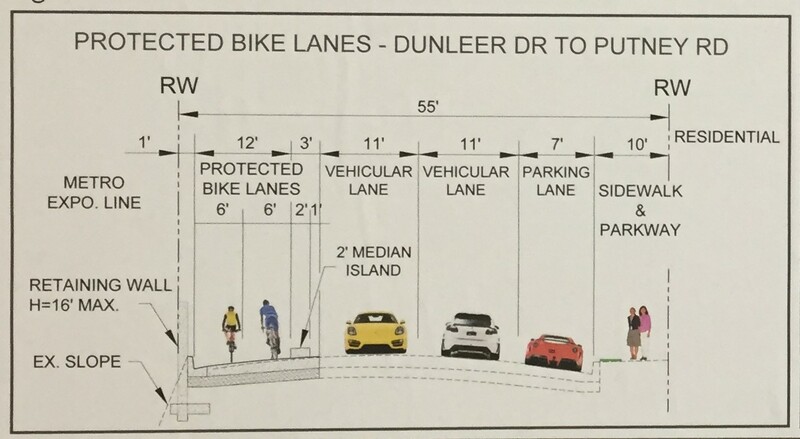 The option two cross section showed more ample lanes: six feet for bike lanes, and eleven feet for car lanes (excessive for such a quiet residential street). These widths necessitate more engineering to widen the roadway, and extend it above the adjacent slope, hence tripling the estimated cost to $36 million. Like option one, parking on the south side of Northvale would be removed. Additionally the expanded width would necessitate greater tree removal. The third option would be to put the bicycle path into the trench where the train runs. This would necessitate building access ramps and retaining walls, so it is most expensive option at an estimated $52 million. That is a very steep cost for 0.7 miles of bike path, though it would preserve nearly all of the existing parking on Northvale. At this point, the gap closure project is not funded. Mowery stated that LADOT intends to pursue “grants available.” Though she did not specify the source of the grants, it is likely to be the state Active Transportation Program and/or Metro Call for Projects funding. Even at its cheapest – $13 million – this is likely to be among the most expensive cost-per-mile bike facilities competing for those funding sources. It would not be impossible to fund an expensive project like this, but it could be difficult, necessitating things like matching funds to make it more competitive. And, on top of the stated costs, there is also a potentially thorny issue in regards to easement acquisition. 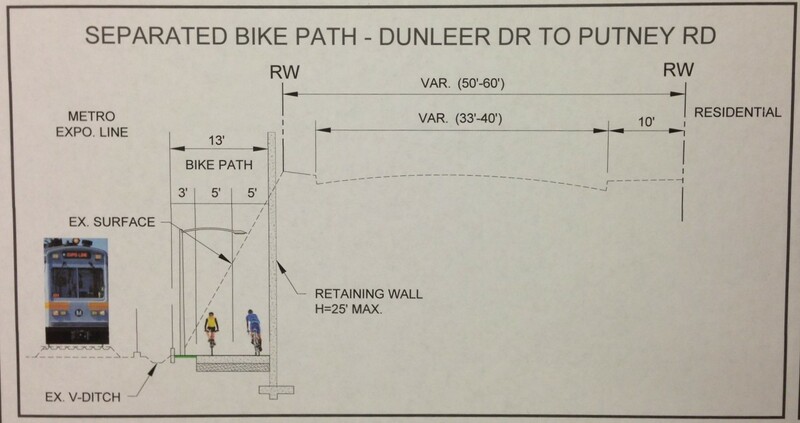 The eastern portion of the bike path (roughly Dunleer Drive to Motor Avenue) will run on an undeveloped sewer easement that runs behind about a dozen homes. The property owners can not build there, due to the sewer easement. But the city cannot build a transportation facility on what is solely a set-aside for sewers, so the city will need to approach these property owners and “buy” easement rights from them. In a similar situation on the L.A. River bike path through Elysian Valley, the city offered a few thousand dollars for using unbuildable easement areas, and most owners took the offer, but one held out, asking for several hundred thousand dollars. Ultimately, the city went to court and won, but the cumbersome acquisition process delayed the project a couple years. Wow. Sounds incredibly complicated. Option 1 sounds the most practical all around. I hope they go for it. While the curb separation of Option 2 may sound nice on paper any solution that requires a wider street sounds like an invitation for another local speedway. After the so-called “improvements” done to Overland Avenue all involved would do well to keep a nice quiet street like Northvale a nice quiet street. Thanks for the report Joe! Looks like all they drive there is race cars. If you look at the first diagram, looks like there’s a Porsche and Ferrari. Even their SUVs look kinda racey! I’m betting those are signal occupancy vehicles too. Hell they’re opposed to anything that isn’t a race track! Maybe we can work together to build a grand stand? How are chevoit hills princesses “like sitting ducks”? Do they think that the bike path will finally allow minorities into their neighborhood who will then rob them at gunpoint? The absurdity and profound stupidity of socal is on full display when cyclists, who are the real sitting ducks, are left to fend for themselves on hostile urban highways while those who sit comfortably in SUVs feel theatened and oppressed by a 6ft wide path even though that path takes cyclists off of “their roads” and puts them in a place where they don’t have to see or think about us. I feel like going to this neighborhood and riding back and forth on the local streets taking the full lane in protest. I’m not sure the local upscale white trash princesses realize that an incomplete bike path means we will use their residential streets. Surely they would hate that more. People who live in a gated community of the mind hate the idea of outsiders using public space within their imaginary castle walls. They just haven’t put that much thought into it, they haven’t moved past their initial emotional reaction to the issue, which is, I guess, what American politics is all about these days. Thanks, Joe, for the meeting update! I also posted a few comments with photos of two of the boards at http://transittalk.proboards.com/post/37578/thread . 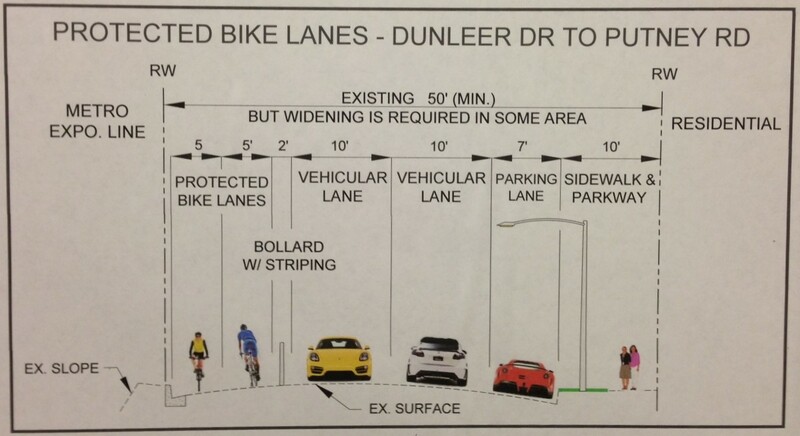 Do you know if they going to paint bike lanes on the north side of National between Palms and Motor? The lane that’s there currently ends abruptly when parking resumes. Will street parking be removed? Why isn’t a cheaper hybrid of option 1 and 2 available? Cut bike lane widths to 5′ in each direction (which is plenty), install the curb with its 3′ of total buffer, and cut the driving lanes to 9.5′ each. You’ve reclaimed 5′ (2′ from the bike lanes and 3′ from the driving lanes) and you’ve still got a quality, safe bike path and more than enough room for cars in both directions—and narrow enough roads to improve safety for drivers and pedestrians along this path. I don’t know – but I’ll ask around. I can assure you james, as a resident of Cheviot for many years, there are plenty of us here who aren’t “princesses” and who are in full support of seeing this project go through. As one of those people, I have to say that the irony of you condemning people with your immature derision puts you right in the same category as those you hold in contempt. You’re not doing the cause much good by being just as trashy as the “princesses”. (by the way, there’s no “gated community” here, and plenty of decent, friendly and progressive families – so maybe it’d be a good idea to dial back the ignorance and righteousness so you don’t come off looking as foolish as those you railing against). With that out of the way, as someone who lives a block away from where this path will go and who travels it on foot, bike and car dozens of times a week, there is ample room for any of these plans to work for everyone – residents and cyclists alike. I look forward to seeing this project completed and plan to use it frequently. Two-way bikeways can be complicated for everyone to use at any intersections. And please note that Caltrans just publicized design guidance for bikeways adjacent to roads; these shown are NOT Bike Lanes, but are Separated Bikeways or more formally called Class IV Bikeways. No one is precluded legally from bicycling on the so-called “vehicle lanes” adjacent to these Bikeways or Bike Paths… except for unfortunate harassment from clueless or road-hog motorists. I would love to see a breakdown of each of these budgets. Even at $13 million, that’s almost $2500 per lineal foot. Where’s the money going? The bike path is the only option. The others require us to ride over the bloody fecking hill that the SP cut through 100 years ago. And to all those people who say “there wasn’t enough room for a bike lane in the tunnel”, i say “prove it”. That tunnel was plenty big enough for a bike lane you guys just had no interest in providing one. IMO, since they want us to ride over the 80′ hill to get from Culver City to Westwood, they should have to offer FREE FARE to anyone going from one to the other, should that someone desire to NOT go over the stupid, fecking hill. I missed Critical Mass and so biked the Expo bike path the other day, and it looks done. The Northvale section is totally unsigned – even temporary signage until the buffered bike path opens would be helpful as I had to bring out my phone and get a map. There are also some bike path signs under plastic bags for some reason, despite the path being totally open to the public. Paul Koretz has delivered is the worst section of the Expo Line. Koretz’ section has a mile-long gap in the bike path. Koretz’ section has kids walking in the street because of a missing sidewalk between the Palms Station and Lycée Français High School.